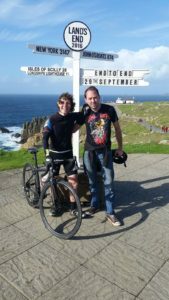 Well done to Jonathan Booth on completing his fourteen day cycle ride from John O’Groats to Land’s End. Jon completed his challenge on Thursday 29th September. Jon has been diagnosed with Stomach and Liver Cancer, but wanted to complete the challenge and, while doing so, raise funds for Western Park Hospital. So far, he has managed to raise over seven thousand pounds. Please visit his JustGiving page to see how well he’s done – and, of course, to donate. You can read all about Jon’s epic journey on his Facebook page. You may also be interested in the ‘Welcome Home’ fundraising party on Saturday 8th October at Opium-No Ten, 10 Peel Parade, Barnsley featuring Maiden Iron.